Summer will be progressing on the Antarctic Peninsula, the cold of Winter has given away to the peak of the season. We will rely on the advanced season to reduce the possibility of ice blocking our way. Meanwhile the penguin chicks are growing rapidly and demanding lots of food so the colonies will be buzzing with activity and whales will be spotted more frequently as they spend their summer foraging in the productive bays and channels. It’s a great time to be visiting Antarctica. Expeditioners will gather at the Cabo de Hornos Hotel in Punta Arenas, Chile. Situated on the shore of the Strait of Magellan, one of the world’s historic trade routes, Punta Arenas enjoyed its first great boom during the California Gold Rush, when it served as a haven for great clipper ships. When the Panama Canal opened in 1914, it lost considerable shipping, but that trade was quickly replaced by Chile’s international wool trade. Today, Punta Arenas has a mix of cultures, from English sheep ranchers to Portuguese sailors and remains important for Chile’s connection with Antarctica. A great place to start in Punta Arenas is the Cerro La Cruz promontory, which provides panoramic views of the city with its colourful tin roofs along orderly streets. Among the city’s most interesting attractions are the Museo Salesiano Maggiorino Borgatello, started by an order of Italian missionaries, and the Centro Cultural Braun-Menendez, housed in the mansion of one of the city’s most prosperous families. The museum provides visitors with an eclectic introduction to the region. The Centro Cultural is equally engaging, offering an intimate glimpse of the life of a prosperous Punta Arenas trading family. For those who enjoy a bit of maritime history, try the Museo Nao Victoria 7.5 kms north of the city on the way to the airport. This museum’s main attractions are the replicas of three very famous ships, Magellan’s Nao Victoria, the James Caird from Shackleton’s Endurance expedition, and Darwins’, Beagle. Punta Arenas is the third largest city in the entire Patagonian Region and is roughly 1418.4 km from the coast of Antarctica. In the evening we will gather for an introduction to our expedition and a briefing on the flight to Antarctica for tomorrow. Our early morning charter flight from Punta Arenas to Antarctica will take approximately two and a half hours. The flight first takes us over the Strait of Magellan then over the Cordillera Darwin with its magnificent glaciers, narrow austral channels and hidden coloured lagoons. Before too long we are out over the Drake Passage and then to King George Island in the Antarctic Peninsula. King George Island is the first landfall in the South Shetland Islands so once you can spot land, you will land shortly. Satellite and weather information will be consulted before departure and during the flight to ensure a safe trip. Bad weather in Antarctica can delay our charter flight from departing on time. We’ll have optional activities available in case of such delay. Our expedition team will be on hand to greet you when you arrive at King George Island. You will have a short walk from the plane to where you will be provided with gumboots for your walk to the beach. From the beach you will board Zodiacs for a quick ride to the Polar Pioneer. You’ll have time to settle into your cabin before we gather for introductions and our mandatory safety briefing. Before we make our first landings, you will be briefed on the guidelines for biosecurity, our behaviour around wildlife, and our procedures for safely boarding our inflatable Zodiacs from the gangway. It’s a busy day on board so don’t forget you are in Antarctica now, be sure to take the time to drink in your surroundings. Kayakers will be introduced to their waterproof drysuits and be briefed for their paddling adventures and the SCUBA divers and snorkelers will check out their own equipment and procedures. Once everyone is well fed and settled in, we will proceed with an operational briefing and our cleanup for biosecurity as the crew sets course for our first landing. Depending on the weather, we will first approach Antarctica near the South Shetland Islands, entering Bransfield Strait either at the eastern end of King George Island or the western extremity of Livingston Island. We may pass by historic Smith Island, which is the outer limit of the South Shetlands. A host of choices are now open to us and depending on the ice and weather conditions the western side of the Antarctic Peninsula is ours to explore. Our experienced leaders, who have made countless journeys to this area, will use their expertise to design our voyage from day to day. This allows us to make best use of the prevailing weather, ice conditions and wildlife opportunities. Because we are so far south, we will experience approximately 18-20 hours’ daylight and the days will be as busy as you wish. There is plenty of time for sleep when you get home! We are always keen to explore new territory, so if the opportunity arises, we will! Who knows where we will go? A unique landing place on the Peninsula – tiny toes of land that are literally alive with wildlife. Here we will find two species of penguins breeding, chinstraps and gentoos. It is not uncommon to find wallows of elephant seals that are 60 beasts strong. Giant petrels nest on the ridgeline. The vegetation consists of mosses, lichens and the only grass species that grows in Antarctica. All this is set against a stunning backdrop, underneath long black scree slopes at the foot of the mountains and glaciers of Livingston Island. A wildlife rich island tucked into a neat bay at the eastern end of Livingston Island. On a clear day the glaciers and mountains of Livingston Island dominate the scene. There is a large chinstrap penguin rookery tucked in between basaltic turrets coloured by yellow and orange lichens. Gulls nest on these turrets and there are often fur seals and elephant seals hauled out on the pebble beaches. At one extremity of the island there is a large colony of nesting blue-eyed shags. At the other end lies a small Argentine station that is sometimes occupied by scientists conducting research on the penguin colony and surrounding waterways. If the ice conditions allow, standing on the bow of Polar Pioneer and quietly moving through the narrow Lemaire Channel could be one of the highlights of our voyage. Cliffs tower 700 metres directly above the ship. The water can be so still that perfect reflections are mirrored on the surface. Gigantic icebergs clog the channel, creating navigational challenges for our captain and crew; occasionally they may even obstruct our passage. Other places we may visit around the Antarctic Peninsula are: Petermann Island; Penola Strait; Neko Harbour; Antarctic Sound; and Scientific Bases of Ferraz (Brazilian), Vernadsky (Ukrainian) or Port Lockroy, a historic British base that is now a museum and post office. Situated on the eastern side of Tabarin Peninsula, the spectacular 745-metre promontory of Brown Bluff towers over some 20,000 nesting pairs of Adelie penguins and hundreds of Gentoo penguins. Nesting skuas, snow petrels and pintados inhabit the upper slopes and kelp gulls screech overhead. Brown Bluff’svolcanic origins have created some fantastically shaped boulders that lie scattered across the ash beach and make colourful nesting sites for some of the penguins. 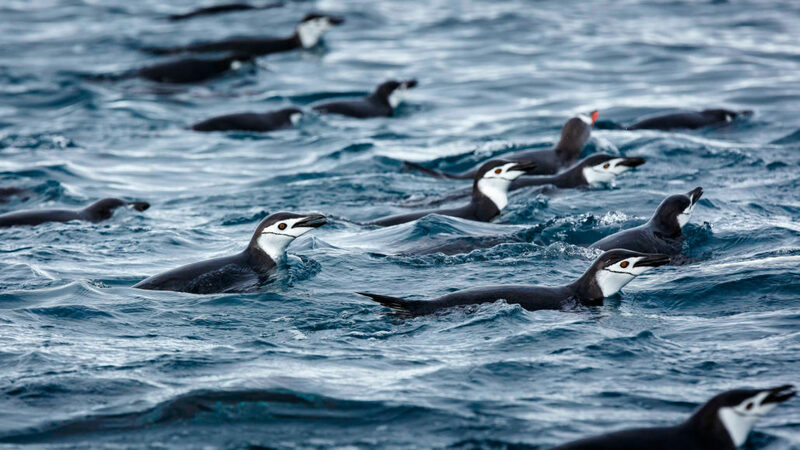 This tiny volcanic island forms the nesting grounds of some 120,000 pairs of Adélie penguins, and the surrounding seas literally teem with penguins! There is also a blue-eyed shag colony situated at one end of Paulet’s long beach front. Leopard seals are often seen cruising offshore, hoping to pick up penguin snack. Weddell seals sometimes haul out here for a quiet nap on the beach. Apart from its plentiful wildlife Paulet is also rich in the history of Antarctic exploration, for it was here that the 22 men of Larsen’s ship Antarctic arrived on 28 February 1903 after their ship had sunk. The men wintered on Paulet, living on penguins ands seals, until eventually Larsen and five of the men rowed across Erebus and Terror Gulf to be reunited with members of Otto Nordenskjold’s geological exploration party. Separated from Trinity Peninsula by Prince Gustav Channel, the beaches and rocks of this mighty island are a mix of volcanic and sedimentary; creating a geologists’ paradise. The beaches arepopulated with kelp gulls while Antarctic terns and skuas nest onthe island’s higher slopes. Many of the island’s rocks are decorated with bright red and orange lichens, presenting fantastic photographic opportunities. Ice flows in the surrounding waters provide temporary floating homes for Weddell and leopard seals. We may walk up to Hidden Lake, following a stream rich in fossilised remains of deciduous trees, ferns and even clamshells. If ice conditions and time permit, we may also circumnavigate this fantastic island; a feat not often accomplished. This very rarely visited island was named for its two striking peaks or ‘horns’. It is the nesting site for some 10,000 pairs of Adelie penguins. If weather conditions permit, we may walk up a scree slope to the top of the island’s western peak. A few hundred metres in height, the summit provides superb views into Erebus and Terror Gulf. On the upper slopes we may even see nesting snow petrels and Wilson’s storm petrels. For those who are less active, the comings and goings of penguins on the beach and the accompanying skua population provide endless fascination. There are often large numbers of grounded icebergs off shore that we may cruise among in our Zodiacs. View Point is one of the few places where we may be able to set foot on the Antarctic continent proper. A British hut was built here in 1953 and an Argentine refuge hut was established a few years later. In front of the old hut are the remains of crabeater seal carcasses, which provided food for the sledge dogs. Thanks to the cold conditions, the well-preserved hut looks just as it did all those years ago – a fascinating place to get a feeling for the golden days of Antarctic exploration. Antarctica’s most conspicuous geographical feature is ice. Glaciers inch towards the sea from towering mountain peaks and ridges. If conditions permit, we hope to cruise south and along part of the spectacular Larsen Ice Shelf, which runs continuously for some 800 km between Cape Longing and Cape Mackintosh. In 1995 a massive iceberg measuring 37 km x 36 km calved from the Larsen Ice Shelf and drifted north. We may see some remnants of this spectacular event and perhaps even witness smaller pieces of ice splitting away. Other places we may visit around the Weddell Sea area and on the eastern side of the Antarctic Peninsula are: Joinville Island; D’Urville Island; Hope Bay; Seymour Island; Snow Hill Island; Vega Island; Prince Gustav Channel; Beak Island; Crystal Hill; Herbert Sound. Time to head back to Argentina’s Tierra del Fuego, with lectures and videos to complete our Antarctic education. This is a time for reflection and discussion about what we have seen and felt, and the impact this voyage has had on us all. 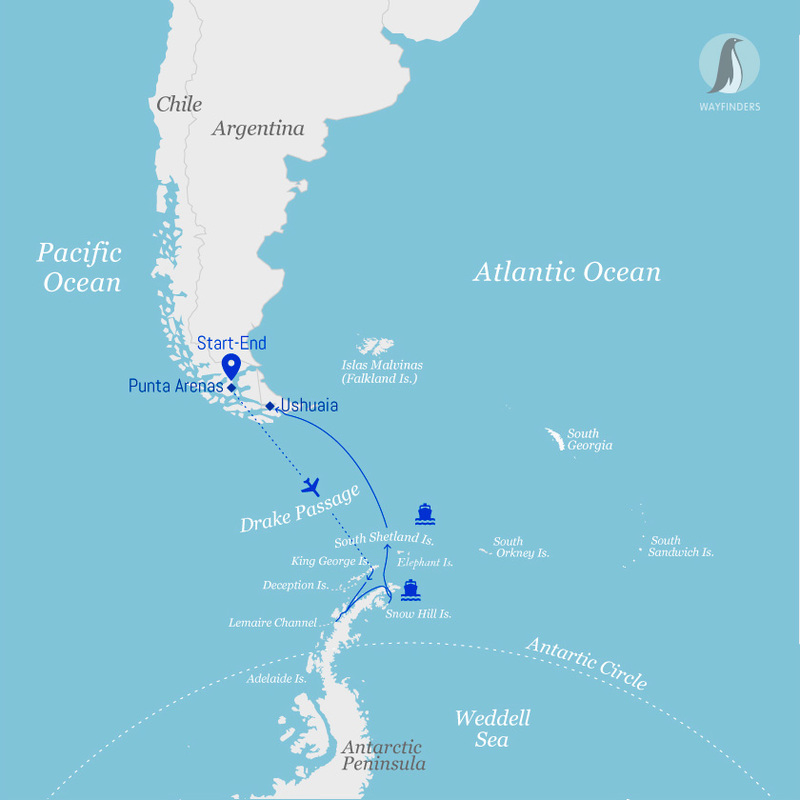 If we have a good crossing and weather permitting, we will try our best to approach the legendary Cape Horn at the southernmost tip of South America. During the early morning we cruise up the Beagle Channel, before quietly slipping into dock in Ushuaia, where you will be free to disembark as soon as the ship clears immigration—around 09:00. It’s a busy time, saying farewell to our expedition staff, crew and fellow passengers who have shared the intensity of exploring this magnificent white wilderness. We head off in our different directions, hopefully with a newfound sense of the immense power of nature. At the conclusion of the voyage, flights are not to be booked from Ushuaia prior to 12 noon on the day of disembarkation. All entry fees to historic landings sites.